Many people consider oral surgeries to be painful procedures, however thanks to advances in modem cosmetic dentistry, tooth extractions have become relatively quick and painless. At KR Dental, our team of dental professionals are highly trained in performing a variety of extractions, including wisdom tooth removal. If you’re experiencing any of the symptoms above or are worried about a tooth that may require an extraction, we’re here to help. Simply schedule a consultation with our friendly team as soon as possible. Before oral surgery takes place, our dentists will use our state-of-the-art dental technology and equipment to further examine the site of the tooth. This allows us to determine if extraction will have the best outcome for the patient, or if there are any other ways to save the tooth. 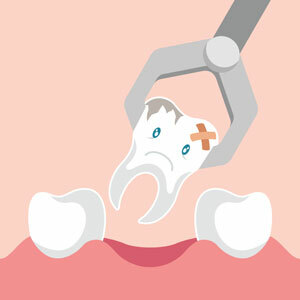 If extraction is required, the patient will then be scheduled to come back at a time of their convenience. On the day of the extraction, our dentist will discuss the procedure further and answer any additional questions the patient may have. To begin the extraction, sedation and pain management will be administered to ensure the patient remains comfortable and pain-free during the surgery. Overall, the extraction process will take between 30 – 60 minutes to complete, however this will depend on the complexity of the case, as well as how many teeth are being extracted. If necessary, the gum tissue will also be stitched, and antibiotics or pain killers may be prescribed. A follow-up appointment will then be made to allow our dentists to assess the patient’s progress and healing. If you’re experiencing dental pain or discomfort, please schedule a consultation at KR Dental today. Our caring and professional team are always on-hand to offer their assistance.